Home » Loss of Falcon effect on next-gen Mustang? Loss of Falcon effect on next-gen Mustang? 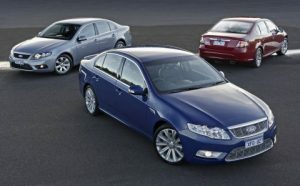 The Sydney Morning Herald has reported that the existing rear-wheel drive Falcon will be replaced by a front- and all-wheel drive Taurus-based product in a few years. This is a very important bit of news for Mustang enthusiasts because a common rear wheel drive platform could have been shared for the next generation of the Falcon and Mustang, saving significant development costs and enabling a financial model that could have paid for more extensive advanced weight-saving technologies. If this move by Ford is confirmed, then the future evolution of the Mustang becomes an open question. We know that a replacement Mustang is coming in a few years, and the big question is whether we will get a warmed-over version of the current dumbed-down chassis, or something modern and perhaps even approaching state-of-the-art. Federal regulations have determined the future course of the Mustang: total weight will need to be reduced so that fuel economy can increase even further. And if weight can be significantly reduced, variations of the current base V-6 and the GT V-8 engine can be used further out into the future that they would be able to be used otherwise. Our primary interest is of course in the suspension, where the Falcon has had an independent rear suspension (and SLA front) for many years while the Mustang (with the temporary exception of the troublesome SVT bolt-in) remains stuck with the most antiquated suspension design of any Ford car in North America (even the Expedition has a more sophisticated suspension design than the Mustang). Can the next Mustang solve the weight question and the suspension question? If you thought that the new engines in the 2011 Mustang were the sole savior of the Mustang’s future, you’d be wrong. They were the easy part, since they were just hand-me-downs from other platforms. The hard part is losing a couple of hundred pounds of weight at a minimum in the next iteration of the car, and several hundred pounds in the longer term. Hard not only in engineering, but particularly in cost. In fact cost is the overriding challenge and it will have the largest impact on Mustang enthusiasts. Alan Mullay’s “One Ford” strategy means that investments in technology are spread across several products. The best example of this is Ford’s C-class platform, which will yield 10 separate products, all of them offered worldwide. And “One Ford” precludes having an “orphan” chassis in Australia or North America. So both the Falcon and Mustang must change. “To what?” is the unknown. Simple top-hat update on top of the existing platform. Unlikely, since that’s what the 2010 was. Creation of an all-new platform for both the Mustang and Falcon. Per the Australian article above, the reality of the Australian market is that there isn’t very enough volume left in the segment to support a stand-alone platform and manufacturing for the Falcon. As the article says, sales are at the worst point in 50 years. Holden isn’t doing very much better, although they do have the benefits of an export market with variations of products on this chassis going to worldwide markets including the Middle East and soon for Chevrolet to North America. Remember that the Camaro is built on a variation of this chassis – it was changed slightly, but in any case is moving to a lower-cost variant of the new Alpha chassis in 2015 or thereabouts. So the volume of the Camaro will not benefit Holden any longer. Technically the Falcon platform is out-dated… the last update was just a “top hat” on top of a platform that didn’t receive any particular focus on weight reduction or efficiency. It’s not the rear wheel drive platform we’d want for a new Mustang given the far forward position of the engine, more like an SN95 than an S197. And while the rear suspension is independent, it was done on the cheap with a lot of stamped parts. And a trailing-arm design, while space-efficient, isn’t optimum for handling. The current Falcon uses a short/long arm front coilover suspension, and a rear trailing-arm independent suspension. 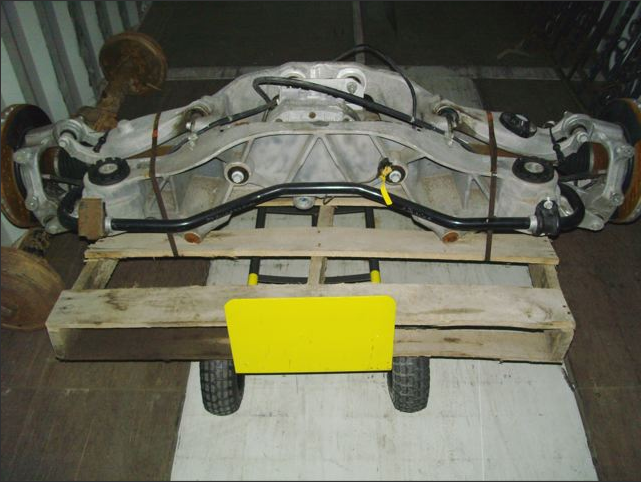 When Ford developed the final S197 chassis and it’s planned IRS (canceled from production at the last moment in a cost-savings move), they had already abandoned the Falcon IRS early in the development process and ended up developing their own aluminum-intensive and highly optimized IRS. And it’s weight was very comparable to ye olde iron and steel solid axle. Too bad it’s stuck on the shelf. “One Ford” means literally that – the Taurus platform is intended to be be the sole worldwide large-car platform. If, as the article states, a decision on the future of the Falcon chassis is due in 6 months, then the Australians are scrambling to create a business model for their otherwise-“orphan” Falcon product line. The Mustang would almost certainly be a part of that plan so that the financials can be spread across multiple products. A new Mustang is likely for 2015… whether it will be a variation of the current car or use a shared platform with the Falcon is the big question. The idea of sharing a platform with the current much-larger Falcon would add weight and size to a future Mustang, as this same plan did with the Camaro. A 190-inch 3900-pound Mustang won’t work when increased Federal mileage and emissions regs will require a car a little smaller than the current Mustang and much lighter. We have have to remember when talking about a future Mustang that Ford doesn’t have something like Nissan’s FM platform, which spans everything from the Z on up to the Infiniti M. This makes for a slightly too-heavy Z, but it does give Nissan/Infiniti planners the advantage of enormous cost savings and the ability to share a wide variety of engines across the products. As one example, the new hybrid components first used on the M in production (first publicly shown in early development form on a G) could even be used to create a hybrid Z, which would increase performance significantly and deliver significantly increased fuel economy. The FM platform is very flexible and was certainly an extremely worthwhile investment for Nissan to undertake many years ago. Ford had something like the FM platform in the DEW98 platform… it was very efficient and very highly aluminum-intensive. It was used for three products (Jag S-Type, T’Bird, LS), planned for several more, and was also intended to underpin an all-new Mustang as well. However, after a lengthy internal study was conducted (I corresponded with the person leading the study at the time), the plan to use it for the Mustang was dropped due to cost restraints. Too bad, because we would have been enjoying a Mustang with a world-class chassis for the past 10 years. Now this platform is gone (although living on with Jaguar), and with it any idea of rear wheel drive products for Lincoln. Blame it’s loss on Little Billy Ford, who thought he could run a car company but ended up running it into the ground, ruining lives and killing booked product plans along the way. Given the recent news and all this background, the worst case (for us) but most likely (for Ford) scenario is that Ford will have to to soldier on with a variant of the current Mustang chassis. Ford engineers will need to bring the structural integrity up to the expected standards while simultaneously dropping a couple of hundred pounds. Fortunately, because the engines are hand-me-downs from other much higher-volume products, there is a path already established to even better mileage and emissions just from the engines alone. Shifting the engine mix around a bit could help, as would the use of the EcoBoost 2 liter for a base engine (and at a minimum of 237 HP there’s nothing wrong with that), dropping perhaps another 150 pounds. So perhaps the chassis people will aim for a 200 pound drop (perhaps using some of the technology being developed for the next-gen F-150, you may have read about this project). A shorter rear overhang, with a hatchback and IRS, would eat up part of the loss, perhaps resulting in a car overall 100 pounds less than todays Mustang. That’s hardly enough on it’s own to meet the upcoming Federal requirements. But combine erngine improvements already in the pipeline (such as Direct Injection) and planned (variable valve lift) with a net loss on a base 4-cylinder models of as much as 250 pounds, and an evolution of the current platform could suffice into the next decade. Speculation is just that… we’ll have to wait for spy pics of development mules in a couple of years to know what decision Ford makes in June of this year. But as one driving enthusiast to another, we’re very disappointed with Ford. Ford has never shown what it’s capable of with the Mustang from an engineering standpoint… only from a budgetary standpoint. Given the enormous profits that Ford generated in 2010, and with every expectation of an even better 2011, it’s time to spend the money on a state-of-the-art rear wheel drive platform.